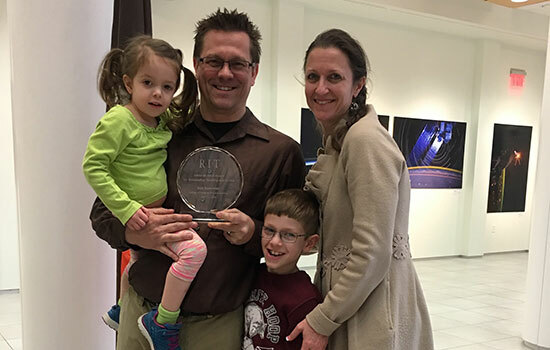 Eric Kunsman, a lecturer for the visual communications studies department in NTID and an adjunct professor for SPAS, is shown outside RITâ€™s University Gallery with his daughter, Viviana; son, Bryce; and wife, Sandra, after receiving the Edline M. Chun Award for Outstanding Teaching and Service. Eric Kunsman, a lecturer for the visual communications studies department in the National Technical Institute for the Deaf and an adjunct professor for the School of Photographic Arts and Sciences in the College of Imaging Arts and Sciences (CIAS), is the fifth recipient of the Edline M. Chun Award for Outstanding Teaching and Service. Named in honor of the late RIT adjunct professor Edline Chun, the honor has been given annually since 2014 to a CIAS adjunct faculty member who exemplifies excellence and dedication in teaching to a CIAS-affiliated school and to the college. The award was announced recently at a reception for CIAS adjunct faculty in the University Gallery. Before coming to RIT in 2000, Kunsman, a native of Bethlehem, Pa., was an assistant professor at Mercer County Community College, where he also served as the coordinator of the photography program. He has led national workshops on photography and digital printing. He holds an MFA in book arts/printmaking from the University of the Arts in Philadelphia and an MS in electronic publishing/graphic arts media, BS in biomedical photography and BFA in fine art photography, all from RIT.